Enjoy countless hours of fun under the sun this summertime and take your Jet Skis to the pristine waters of the beautiful Lake Hamilton in Hot Springs, Arkansas. But before you do, be sure to learn the different rules and guidelines around Lake Hamilton to ensure that you have a great and safe time. Remember, these rules and regulations were created for your and your family’s protection so be sure to abide by these rules. Wear your life vest and make sure they are strapped on properly. Check if you have sufficient fuel. Always follow the recommended capacity of your motor vehicle to ensure the safety of your passengers. Remember that the minimum age for operating personal is 16. Those aged 12 – 16 are still allowed to drive personal watercrafts, provided that they are riding with an operator aged 18 or older. Have your Jet Ski inspected days prior to use to make sure there are no problems. Leave a float plan with a relative, friend, or someone at the marina that contains details such as make of the vessel, planned route, time of departure, and estimated time of return. Always check the weather forecast for possible changes in weather patterns while in the water. Are engaged in fishing activities. When operating the Jet Ski at night, always have navigational aids at night such as various lights and be on the lookout for the lights on other vehicles. Better yet, avoid going on your Jet Skis at night. Keep an eye out for floating objects on the lake, such as swimmers, navigational aids, and debris. Always consider the effects that your Jet Ski might have on the environment. Make sure you operate on waters that are deep enough to avoid bottom sediments and aquatic vegetation from being entangled on your vehicle, minimizing damage to the environment and to your vehicle as well. Do not operate near the shores to avoid erosion. Do not dock in reeds and grasses. Take extra care when refueling your Jet Ski to avoid oil spills. Know your limits and ride according to your abilities. Never exceed the manufacturer’s recommended capacity of your Jet Ski. Do not operate your Jet Ski when under the influence of alcohol. Operating within 100 ft of a towboat. Jumping the wake of another vessel too close. Swerving at the last possible moment to avoid a collision. Not paying attention and failing to keep a proper lookout. Failing to observe navigational rules. Colliding with another vessel or object. Operating in such a way that interferes with the safe navigation of other vessels in the lake. There must be an observer present, at least 12 years old, in a position to observe the skiers being towed. All persons being towed must wear a USCG-approved personal floatation device (PFD). Outside of designated areas with proper lighting, it is illegal to tow persons between 30 minutes after sunset and 30 minutes before sunrise. It is illegal to operate or manipulate any towing vessel in such a way that causes towed device or persons to collide with any object or persons. 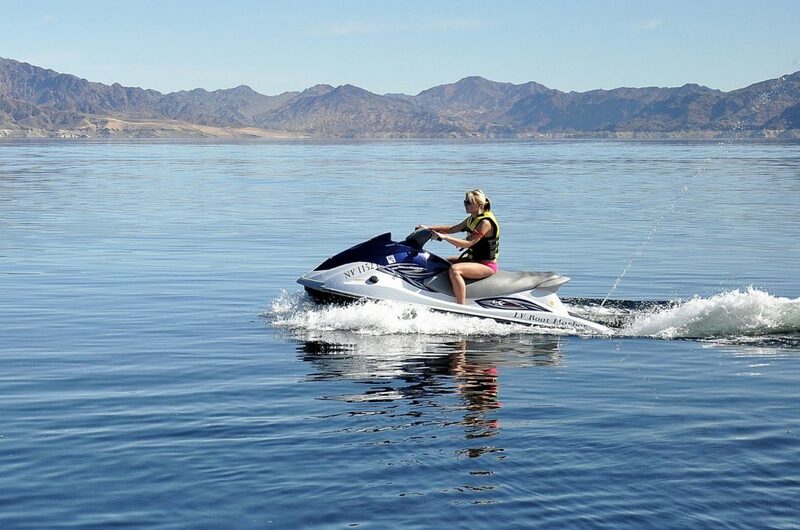 If towing a person on skis, the Jet Ski must be rated to carry at least three people – the operator, the observer, and the retrieved skier.